Our leadership provides the direction, vision and accountability that has kept us true to our mission and His mandate for over 115 years. Our entire leadership team gives oversight to all the areas of campus life. They each seek to create a culture of leadership that is modeled on the Word of God. At the same time this culture is lived out in a way that prepares our students for servant leadership. Rev. Rodney Loper is a native of Fairborn, Ohio. His family attended Franklin Bible Methodist Church. After high school, Rev. Loper attended God’s Bible School & College (GBSC), graduating with the BA in Ministerial Education in 2001. He later completed the MA in Leadership and Preaching from Trinity Theological Seminary. While enrolled at GBSC, Rev. Loper was assistant pastor at Franklin Bible Methodist Church from 1999 to 2001. Following graduation, he pastored in Oklahoma City, OK. In 2007 he joined the pastoral staff of Hobe Sound Bible Church and was the senior pastor from 2009 until 2016. Along with other pastors from Hobe Sound Bible Church, Rev. Loper has frequently participated in GBSC’s annual Aldersgate Forum. Rev. Loper and his wife, Melissa, met at GBSC. They have four children. Our Board is made up of 13 members. 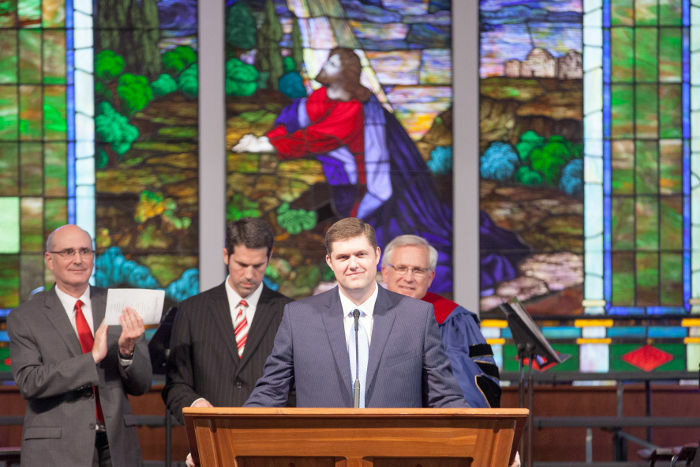 In 2017, Dr. Michael Avery was named God’s Bible School & College’s first Chancellor. View photos and descriptions from that historical event.